Fifty leading writers retell myths from around the world in this dazzling follow-up to the bestselling My Mother She Killed Me, My Father He Ate Me. Icarus flies once more. Aztec jaguar gods again stalk the earth. An American soldier designs a new kind of Trojan horse—his cremains in a bullet. Here, in beguiling guise, are your favorite mythological figures alongside characters from Indian, Punjabi, Inuit, and other traditions. Aimee Bender retells the myth of the Titans. Elizabeth McCracken retells the myth of Lamia, the child-eating mistress of Zeus. Madeline Miller retells the myth of Galatea. Kevin Wilson retells the myth of Phaeton, from Ovid’s Metamorphoses. Emma Straub and Peter Straub retell the myth of Persephone. Heidi Julavits retells the myth of Orpheus and Euridice. Ron Currie, Jr. retells the myth of Dedalus. Maile Meloy retells the myth of Demeter. Zachary Mason retells the myth of Narcissus. Joy Williams retells the myth of Argos, Odysseus’ dog. If “xo” signals a goodbye, then xo Orpheus is a goodbye to an old way of mythmaking. Featuring talkative goats, a cat lady, a bird woman, a beer-drinking ogre, a squid who falls in love with the sun, and a girl who gives birth to cubs, here are extravagantly imagined, bracingly contemporary stories, heralding a new beginning for one of the world’s oldest literary traditions. 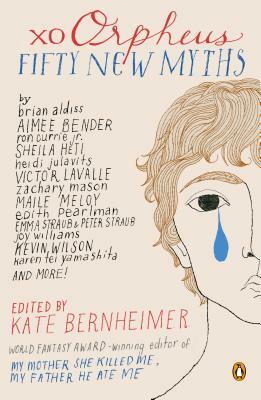 Kate Bernheimer is the editor of the World Fantasy Award-winning anthology My Mother She Killed Me, My Father He Ate Me: Forty New Fairy Tales and the founder and editor of the literary journal Fairy Tale Review. The author of numerous works of fiction, including How a Mother Weaned Her Girl from Fairy Tales, she teaches in the English department at the University of Arizona.